PT Astra Honda Motor (AHM) Indonesia, bringing the latest motor sport unit of the All New Honda CBR250RR in the event CBR250RR Premiere Night Gathering - Expect the Unexpected. Activities that invite 1,000 members of this community of lovers of motor sport, held in eight major cities spread over various islands in Indonesia. The enthusiasm of the lovers of motor sport to look directly at the All New Honda CBR250RR prepared to answer AHM through CBR250RR Premiere Night Gathering - Expect the Unexpected in Yogyakarta and Denpasar, Bali on October 8, followed by Medan, North Sumatra and Palangkaraya, Central Kalimantan, on October 15, Makassar, South Sulawesi on 23 October, and closed in Solo, Central Java on November 5, 2016. previously, a similar event has been successfully held in Bandung, West Java and Surabaya, East Java, on August 6, 2016 to the attention of 322 community members in attendance to see more near All New Honda CBR250RR. 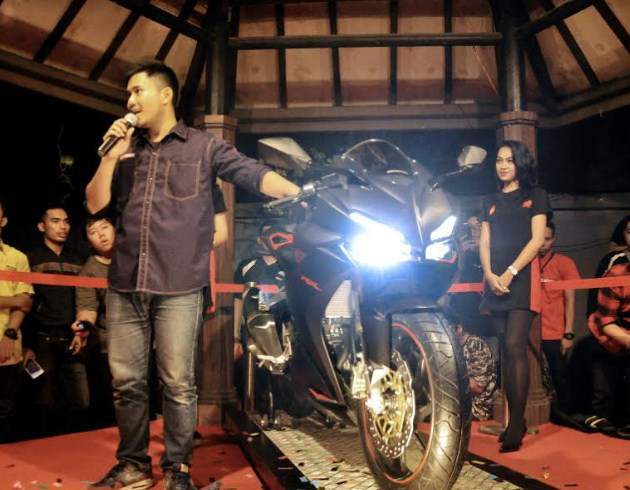 Event Premiere Night Gathering CBR250RR is packed with premium and exclusive atmosphere in accordance with the concept and the products promoted by this event, the All New Honda CBR250RR. Participants premiere night and bercengkeramah can relax at the cafe while listening to live acoustic. General Manager Marketing Planning and Analysis Division AHM, Augustinus Indraputra said the enthusiasm of the lovers of motor sport in Indonesia against the All New Honda CBR250RR is very high, as evidenced by the pivot of more than 2,000 units. Therefore, AHM provides a special opportunity for community members to directly feel the first impression of the latest products. "We invited 1,000 members of the community of lovers of motor sport in Indonesia as a form of high appreciation to the lovers of motor sport who have welcomed the presence of the All New Honda CBR250RR with great enthusiasm. This model we hope to be the answer to the needs of motorcycle enthusiasts to the motorcycle premium design and best performance in its class, "
This night at the premiere of the members of the community joined in motor sport Honda is Honda CBR250R, Honda CBR150R and Honda CB150R show the spirit of One HEART by city rolling around the city. The members of this community can also do the tapping hcid (Honda Community ID) hers at this event. Hcid is the identity of all members of the community of Honda motorcycle lovers. By tapping on any community event members can add its points can be exchanged for merchandise pulled from Honda. The members of the community who want to be part of the consumer pivot All New Honda CBR250RR can do with a few easy steps, that populate the data on the website www.cbr250r.com/indent and visit dealers who have been on the website indent. 0 Response to "All New Honda CBR250RR was Introduced to the 1000 Community of Motor Sport Lovers, Especially 8 Major Cities in Indonesia"